New PTBooth A1 PRO has been released! In addition to all of the features and functionality of the PTBooth A1 PLUS, there is a unique advanced feature in the PTBooth Transfer App. 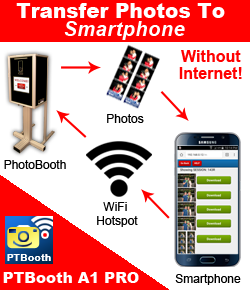 PTBooth Transfer App will allow your Customers to INSTANTLY DOWNLOAD PHOTOS TO THEIR SMARTPHONES. And, because the INTERNET IS NOT REQUIRED, you will save on your operating costs. DOWNLOAD PTBooth A1 PRO Today!